The hour-long drive down to Sonoita on a Sunday morning was stress-free (mainly because Matthew drove), and Rancho Rossa Vineyards was easy to find in Elgin, which is about six miles southeast of Sonoita. The directions on their website are concise, but contain all the information you need to navigate smoothly. They also have clear signage as you approach the vineyard. Well-behaved leashed dogs are welcome visitors at Rancho Rossa Vineyards. Owners Chris and Breanna Hamilton operate one of the largest family-owned wineries in the area. They produce nearly 1100 cases of wine each year from their 24 acres of estate fruit. They are the only winery in the Sonoita Viticultural area that is 100% estate, which means they use only the grapes they grow on site. After stretching our legs, we were warmly greeted in their dog-friendly tasting room by Sandie, the tasting coordinator, and Breanna Hamilton, one of the owners. We spent about 90 minutes tasting their wines, relaxing, and intermittently talking to Sandie and Breanna. They were both gracious hostesses who were knowledgeable about their wines. After tasting six different wines, we purchased two bottles of wine, but we’ll be ordering more. I’m sure. What makes Rancho Rossa stand out, though, is their genuine dedication to local animal rescues. They have two wine labels where 100% of the profits are donated to help rescue animals. Pound Hound, a Cabernet Sauvignon, features their dog Bubba on the label, and 100% of the profit is donated to the Santa Cruz Humane Society. Rescued Hearts Cellars features their 8-week old puppy George Bailey, who crossed the Rainbow Bridge after just seven weeks with the Hamiltons. Read more about this special boy’s story. All of the profits from Rescued Hearts Cellars benefit a local campaign called Pay Off Vet Debt, which triples all donations to pay vet bills for various Southern Arizona animal rescue organizations. 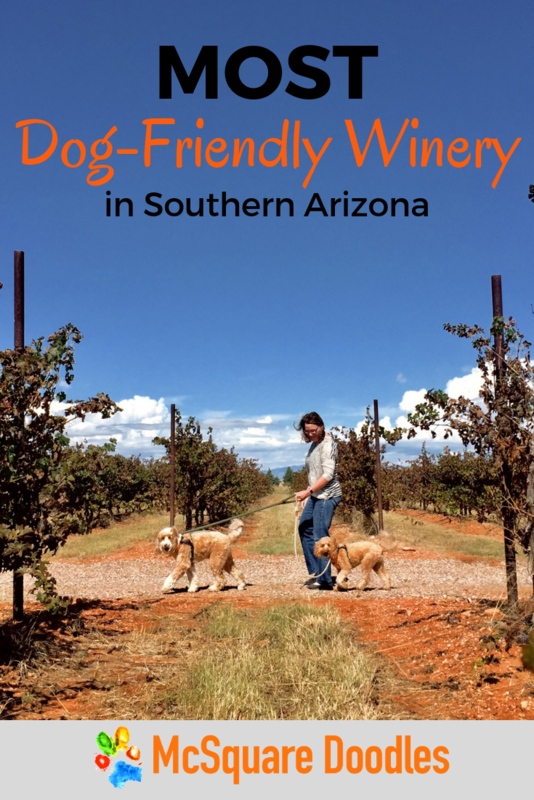 If you’re visiting the Tucson area, don’t miss a worthwhile day trip to this winery. As Matthew and I watched Bernie and Lizzie’s noses eagerly quiver with each tasting pour, we knew the whole pack was giving Rancho Rossa Vineyards a solid Paws Up!